I had always thought that if a Jew became a serious candidate for President, I would very likely support him. Of course that support would have been dependent on whether his political views for the most part reflected my own. But I must admit that it is a matter of pride to see ‘one of my own’ as President of the United States. So being a Jewish candidate is weighted heavily in my consideration of whether to vote for him. This was the case with Joseph Leiberman – when Al Gore chose him as his running mate. Even though I tended to lean more with George Bush politically, I felt at the time that Gore’s views were close enough to mine so that his VP choice swung me over to his side. And certainly Lieberman’s views were similar to mine. My pride was not only that an observant Jew was chosen by the Democratic nominee, it was in the fact that Leiberman’s addition to the ticket actually improved Gore’s odds in the polls. Before Leiberman, Gore trailed Bush by 10 percentage points. After Leiberman the race became a dead heat. I recall a poll conducted by one of the leading newspapers at the time asking voters whether Leibeman’s Orthodox Judaism would hamper his job as President - which he would have been a ‘heartbeat’ away from if elected. The answer surprised me. A common response was that his religious views were considered an asset. One that gave him an ethical advantage. That was a seminal moment for me. It showed me that mainstream America is not only - NOT antisemitic, but that they are actually philosemitic - unlike any other country in the history of the world. Image that, I thought. Observant Jews were now seen to be the most ethical of people. America is truly different. This is not like the golden era of Spain that lasted about 500 years where Jews thrived. This was a sea change in attitude by the non Jewish world in America. Esav did not hate Ya’akov in this country. Especially if he was observant. It is still a tribute to the American people that Bernie Sanders’ Judaism is a non issue - no matter what side of the political aisle they are on. But I am sorry to report that I cannot and do not support him. That Bernie Sanders is not observant is not the issue. The issue is that his views on Israel are at best naïve and at worst - it would cause great harm to the Jewish State if his views became policy. It is one thing to express sympathy for the plight of Palestinians as he does. I too have expressed sympathy for their plight. I just see the blame for that placed squarely on the Palestinian leadership and on a base underlying Muslim/Arab hatred of the Jewish people. That foments a constant stream of violence to which Israel must react - sometimes harshly - in order to protect its people. First, I would never support a socialist for President, Jewish or not. But even if I would tolerate his socialism, his attitude about Israel is unacceptable. And his attitude will have a definite impact on the Democratic party. 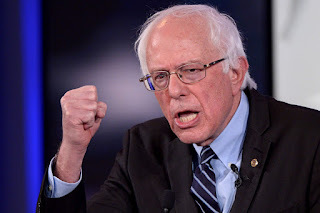 Because of his wide popularity among various demographics, primarily among the young, the DNC (Democratic National Committee) is letting him choose 5 of the 15 people that will form the party platform. 2 of the people he has chosen are not ‘Israel friendly’ to say the least. When a Jew chooses people that are as overtly anti Israel as James Zogby and Cornell West – that becomes extremely problematic to me. “It’s ugly, it’s vicious, it’s brutal”: Cornel West on Israel in Palestine… there is no doubt that Gaza is not just a “kind of” concentration camp, it is the hood on steroids. Of course then he added the obligatiory disclaimer about not being antisemitic – just anti Zionist. I realize that party platforms have become pretty meaningless these days. (I think Trump actually said that he doesn’t care what his party’s platform says.) But I disagree. It’s true that the platform has little to do with what a President’s actual policy will be. But I don’t think it can be ignored. If you have a party platform that advocates changing the way it deals with Israel – as now seems will be the case, it should give supporters of Israel pause. If that party’s candidate does not completely disavow that portion of the platform, that could spell disaster in the future. Because it sets up a mindset that that party should be more even-handed in dealing with Israel that a President may take into account. In ‘Middle-Eastern speak’ that translates into less intelligence sharing; less military aid; and less foreign aid; all in the guise of being even-handed. A tilt like this could weaken the military edge Israel has over its neighbors and make them far more vulnerable. There is not a doubt in my mind that terrorist entities like Hamas and Hezbollah will take advantage of any weakness they perceive in Israel’s defense capabilities as a result of a shift in American policy. Israel does not need to be in this position. They need all the help they can get. Which leaves me with a dilemma. I do not see how I can support Hillary Clinton if she does not disavow any kind shift away from supporting Israel by her party. On the other hand. I can’t think of a worse choice for President than Donald Trump. I guess I will have to wait and see how this all plays out over the next few months. But I will not vote for a candidate whose party platform weakens Israel. As of now however, no endorsements.